The beautiful, deep brown color and rich flavor in this gingerbread recipe comes from the dark molasses, which is very traditional in these old-style recipes. 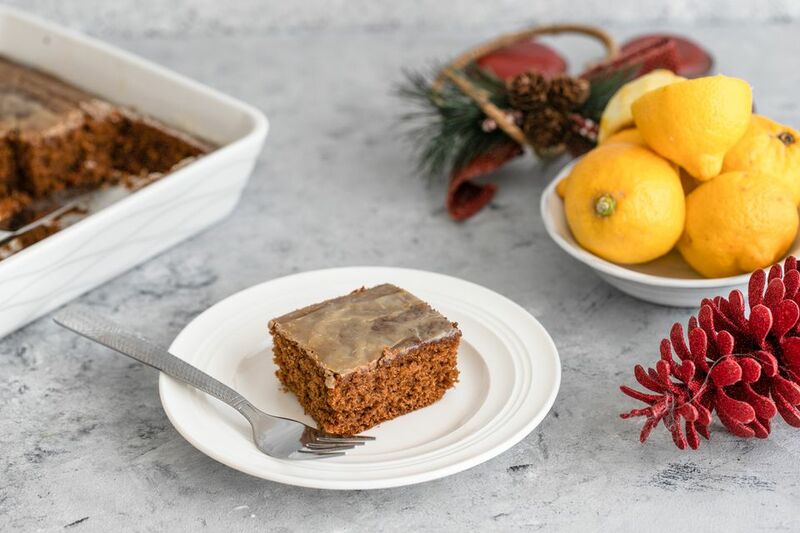 The ground ginger and cinnamon gives this simple-to-make gingerbread recipe it's spicy kick, and the quick lemon glaze finishes this classic American dessert perfectly. Sift together the flour and baking soda into a mixing bowl. Add the ginger, cinnamon, salt, sugar, egg, and molasses. Mix with a spatula until the mixture is combined and resembles wet sand. Add the oil and boiling water and whisk for about 2 minutes until the batter is smooth and shiny. Oil and flour a 9-inch square baking dish or pan. Pour in the batter and tap it down gently on the table to settle it evenly. Bake for 35 minutes, until the gingerbread pulls away slightly from the sides and the top springs back when lightly touched. Combine the powdered sugar and lemon juice and whisk together until smooth. Pour over the hot gingerbread and spread evenly with a spatula. As it cools, the glaze will soak into the top and around the sides. Slice and serve just warm or at room temperature.